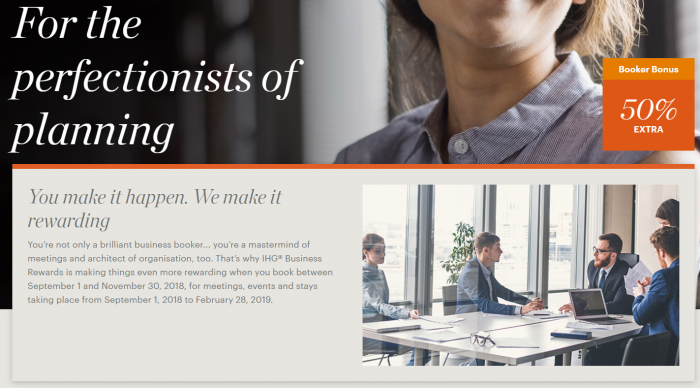 IHG Business Rewards has launched a new 50% Booker Bonus promotion for new meetings, events and stays consumed between September 1 – February 29, 2019.
Business Rewards members must make the bookings between September 1 – November 30 to be eligible for the bonus points. You can register for this offer on IHG’s website here. You normally earn three IHG Rewards Club points per dollar spend that is bonused by 50% during this promotion. IHG Business Rewards is trying to incentivize meeting planners to throw some more business on their way by offering bonus points. The booking stays on behalf of others and earning bonus points this way is actually quite interesting. The members also earn their points for these stays.